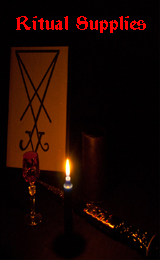 Each candle has had premium, hand-crafted Satanic ritual oil infused in the wax at the time of pouring. Developed specifically for Satanic ritual. 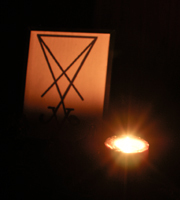 These candles are designed and crafted specifically with Spiritual Satanists' needs in mind. They stand approximately 6.66 inches tall, and are 1 inch in diameter all the way to the base. They are crafted from 100% pure, all-natural cosmetic grade Beeswax, and are wicked with 100% natural, cotton-cored square braided wicks, producing a completely drip-less, smoke-less, and soot-less candle! Beeswax candles are the oldest form of candle known to exist, reaching as far back as the Pyramids and ritual chambers of ancient Egypt, and we here at Satan-Supplies could not think of a better or more fitting form of candle to supply to our customers. These candles will burn clean without leaving any kind of soot or black residue. They will not smoke up your home, and they will provide consistent and steady lighting for you when you need it most! Done are the days of simply using any candle you can find, because it's the ONLY candle you can find. These candles aren't just well suited and effective for OUR practices...they also Honor the Gods! Hail Satan! Please Note: This is a handcrafted item using all natural ingredients that may have imperfections in the wax, or small nicks and scratches that are part of the hand-pouring and handcrafting process. These minor flaws will have no effect on the performance or burn of the candle, and some people believe they actually give the candles more character.